The opening night of our third annual String Theories Festival will feature our first collaboration with the violin duo String Noise performing the World Premiere of Eric Lyon’s Double Concerto featuring special guest Greg Saunier on drums. The Double Concerto, composed for String Noise and the String Orchestra of Brooklyn, is a concerto with the need for speed. 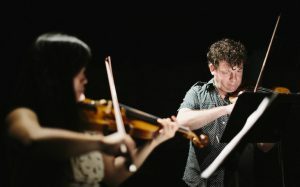 Hybridizing Punk Rock and Classical Music, with Brahmsian bleedthroughs and drum visitations from Deerhoof’s Greg Saunier, the Double Concerto invites chaos from all quarters.